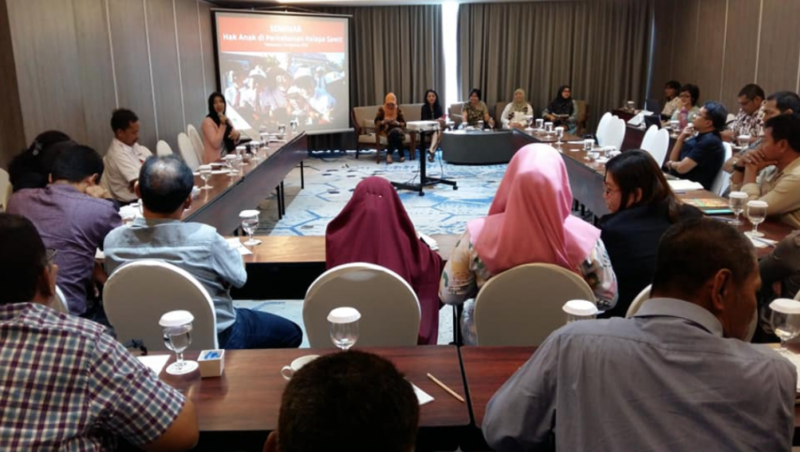 With the aim of introducing Children’s Rights and Business Principles (CRBP) to a wider stakeholder base in Indonesia, RSPO recently hosted two seminars on this topic, in Sumatera on 28 August and in Kalimantan on 4 September. The sessions looked at the findings and practices from a pilot project, conducted between August 2017 and June 2018 in RSPO members’ oil palm plantations, relating to protection of and respect for children’s rights. The key points of discussion during the seminar were the seven CRBP impacts relating to children in oil palm plantations: (1) maternity protection and breastfeeding; (2) childcare; (3) health and nutrition; (4) water, sanitation, and hygiene; (5) access to education; (6) child protection; and (7) child labour and young workers. The CRBP pilot project was first initiated in Indonesia in 2016 by the United Nations Children’s Fund (UNICEF). Its aim was to provide information and knowledge to the management and staff of oil palm plantations on the standards and positive implications of CRBP, as well as to identify best practices relating to fulfilling children’s rights in the seven CRBP impact sectors. Findings were then used as recommendations for the Principles and Criteria (P&C) Review Task Force, thus incorporating CRBP as part of the standards for RSPO members. Lingkar Komunitas Sawit (LINKS) was also identified as an implementing project partner, in collaboration with UNICEF. Seminar attendees included representatives from RSPO member companies and civil society organisations, with representatives from UNICEF, LINKS, Cargill Incorporated and Musim Mas Group as guest speakers. To improve participants’ interpretation and understanding of the impacts on children in plantations, face-to-face CRBP clinic sessions were conducted during the seminars for participating companies such as Sime Darby (Minamas), Goodhope Asia Holdings, Musim Mas Group, Cargill Incorporated, and Bumitama Agri Limited, who were all part of the pilot project. Pusat Kajian dan Perlindungan Anak (PKPA), a civil society organisation (CSO) focused on children’s rights, moderated a panel discussion on CRBP during the seminar. The panelists included Lukita Wardhani of UNICEF, Dr. Feybe E.N Lumuru of LINKS, Yunita Widiastuti of Cargill Incorporated, T. Kanna Rhamdan of Musim Mas Group, and Tiur Rumondang, Director of the RSPO Regional Representative Office in Indonesia. To read the full report of the pilot project, please visit RSPO Supplementary Materials - Human Rights and Social Standards. Please note: Full report is only available in Bahasa Indonesia.